How far in advance can you confirm/lock in your weddingbee date? We are planning a 1/2018 wedding and I am getting so antsy. 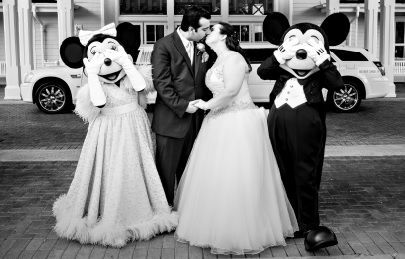 What type of disney wedding are you looking into? Wishes books at 12 months out, escape books at 8 months out, and memories books at 6 months out. You can begin speaking with a sales cosultant at 16 months, 9 months, and 7 months, respectively. Yes there is a chance - Before you can actually confirm your date, other couples are able to pencil themselves for the same slots your are going for. You would then go into a lottery to see who actually gets the date/time. Usually if there are 3 choices that you had given, one of them should work, but there always is that chance. We were up against 2 other couples for our lottery, thankfully we 'won' our 1st choice. It's good to know the timetable for when they book. We don't have a lot of concrete plans yet, so this is helpful! Having been talking to a consultant very recently (as in yesterday), being flexible on your day of week helps you be more likely to get what you want. I'm considering Tuesday or Wednesday weddings and right now, for the two months I'm looking at there are a grand total of 3 Tuesdays/Wednesdays over those two months not available.